Do you like a full-bodied red, with fairly grippy tannin and black fruit? Bold enough to warrant some oak-ageing? A wine that can develop cedar, mocha, graphite with age? Something to pair with hearty roast beef, steak, venison? Then look no further than Cabernet Sauvignon. If you need an excuse to treat yourself, I can give you not one, but two reasons! Firstly, it’s Cabernet Day on August 31st. (Join in the chat on #CabernetDay). Secondly, here’s a list of some amazing Cabernets from some of the best Cabernet regions of the New World. (To learn more about these regions, enrol in a WSET wine course). All were tasted recently, and most come in at €20 or less. Just add juicy roast rib of beef, lamb or venison, for a perfect pairing. 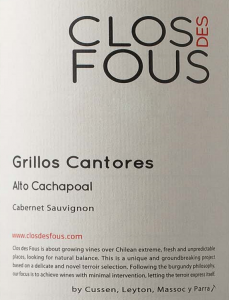 Clos des Fous ‘Grillos Cantores’ 2013 from Chile’s Alto Cachapoal is possibly the classiest Cabernet on the market at this price – perfect for roast beef. I was greatly impressed. Woody/sous-bois, campfire, toast, hints of sweet spice. Fine elegant silky tannin, a lick of lead pencil, fresh tobacco, plenty of toasty cedar, a streak of mocha, with just-ripe blackberry. Closer to Bordeaux in style than Chile. €19.99 (Liberty), Mitchells, Green Man Wines, The Malt House. Rustenberg Cabernet Sauvignon 2014 from Stellenbosch is drinking beautifully now, particularly with rare rib eye. Classic South African sticking plaster aroma, then toasty oak and ripe blackcurrant, with fine-grained tannin. Excellent value, €15.99 James Nicholson Wines. Delheim Cabernet Sauvignon 2011 (Stellenbosch) Very elegant balance of oak & black fruit (damson, blackberry), wound around a core of mild cedar and wood-spice and pleasantly firm fine tannins. Long, savoury finish. €18.95, O’Brien’s. De Martino ‘Legado’ Cabernet Sauvignon 2014 (Maipo) has intriguing campfire smoke intertwined with just-ripe blackberry, hedgerow, and hints of vanilla. A great everyday buy, which holds its own against many others. €16 (Febvre), Green Man Wines, Blackrock Cellar, The Corkscrew, Kelly’s Wine Vault, Gerry’s, O’Donovan’s and Fresh. Kaiken ‘Ultra’ Cabernet Sauvignon 2015 (Mendoza). Toasty, vanilla, square-shouldered, with vibrant blueberry and black cherry, plain chocolate, firm throughout. Decant, or leave a few years to soften up. €21.99 (Liberty), Baggot Street Wines, Fallon & Byrne, Jus de Vine, Redmonds, Martins, Londis Malahide, Fresh, Deveneys Dundrum, Sweeneys, World Wide Wines, The Wine Centre, Callans. Mitolo Jester Cabernet Sauvignon 2014 (McLaren Vale) is quite rich and warming, thanks to the addition of dried grapes. Blackcurrant, chocolate, hints of tobacco. €22.99 (Liberty), Baggot St. Wines, Green Man Wines, Fresh, Drink Store, Blackrock Cellar. dArenberg High Trellis Cabernet Sauvignon 2012 (McLaren Vale)- Intense, full-bodied and vibrant. Lead pencil, cedar, toast, with ripe blackcurrant, cherry, chocolate, and pencil shavings. About €25 (Febvre), Jus de Vine, Martin’s, Londis Malahide, Redmond’s, Lilac Wines, Wineonline.ie, Deveney’s, Donnybrook Fair, Drinkstore, Nolan’s, Nectar Wines, The Wine Centre, O’Donovan’s, Woodberry’s, Egan’s, Ardkeen. Kendall-Jackson Vintner’s Reserve Cabernet Sauvignon 2011 (Sonoma) A taste of beautifully mature Cabernet – vegetal, leather, hint of cedar. Enjoy with lamb. €26.95, O’Brien’s. Cono Sur 20 Barrels Cabernet Sauvignon 2011 (Maipo) – Big, bold attack of super-ripe cassis, eucalyptus, cedar, cigar-box, sandalwood, hints of chocolate. Vibrant and mouthfilling from start to long finish. Try it with venison & juniper. €29.99 (Findlaters) from Mitchell & Son, The Corkscrew and Donnybrook Fair.